I wrote the other day, that I have 37 active credit cards and I think I am at the max that my salary can support for all the credit that has been extended to me. With 37 cards, there have been many hard inquiries into my credit. In the 3 years that I have been active in the credit card games, I have been denied for only four cards. The last denial was stupid, but I was pushing the limits and knew the likelihood was very high. All of the denials came from “too many inquiries.” One of the denials, I was able to convert into an approval, so the real count of denied cards is 3. In August, I applied for the US Bank Cash+, but it was originally declined. I called up the reconsideration number and the agent was able to put the notes into the file and had the underwriters approve my account. What I did not know when they approved me, it was for the lesser product, the US Bank Cash card. This card only earns 1% cash back without any bonus categories. In 6 months, I will request a credit limit increase so I can bump it up into a Cash+ card. Since I’ve previously wrote about the UPromise, I will not rehash it here. The Chase Ink Plus, I did everything I could to over turn the denial. My friend who opened the account for me at Chase couldn’t help over turn the denial either. The reason: too many inquiries. It coincided with the 5/24 rule that seemed to pop up, but I am not a believer of the 5/24 until I try again later this year. I don’t believe in the 5/24 rule based off my conversation that was like pulling teeth. The CSR was holding fast and steady with the too many inquiries. I gave him a solid argument why I needed the Ink Plus and he finally relented that the business was too new and there was no way to overturn it. I incorporated in May and within the week I had applied for the Ink Plus. The too many inquiries wasn’t a strong argument for me and I was pressing him further because I explained to him how well I was handling my credit and all the established accounts are in good standing. Once we moved past that, his excuse was too much credit was extended to me. My counter argument to that was to move credit limits around and I gave him my best shot that moving credit was the approach. Especially because of the fact that I was approved for a Chase Ink Plus for $22,500. I told him, if you look at the purchases that I’ve made with that card and I don’t even come close to using up the credit limit that was approved for me. After that, it was when he explained to me the business was too new. In my final rebuttal I explained to him that I was started a new job and my new employer has in the code of conduct that I can not be self-employed or be employed with another corporation. I further explained that I needed the credit card for the business expenses and was rolling up the other Ink Plus into this new application. His final verdict, still a no. I knew this was going to happen, but I wanted to try my luck at the Citi Premier card for the 60,000 Thank You Points bonus. I had applied for a Bank of America business credit card, applied to a student loan, opened the 100,000 Membership Reward American Express Platinum card, and the aforementioned US Bank Cash card. That was 4 hard inquiries within a short span. When I applied to Citi it was an instant denial. I explained to Citi’s reconsideration line that I tried to product change my AA Gold card into this Premier card, but the CSR wouldn’t let me do it so I had to apply for a new card. It wasn’t flying with Citi. I made my case with reconsideration and she was ready to go to bat for me, but she was telling me it’s going to be really tough because there’s too many inquiries even if she added my notes to the case. The shocking part and I did not want it to get any further, she told me in order to be reconsidered, she would have to do another hard pull. After she said that, I said no thanks. 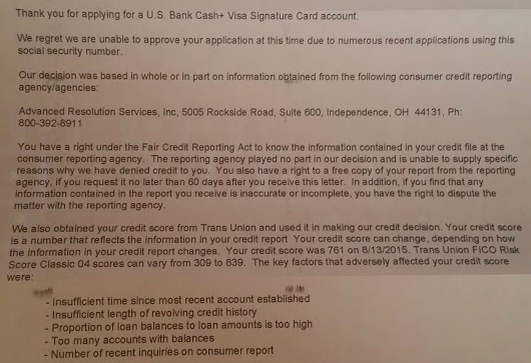 For US Bank, I actually called reconsideration before the denial letter came in. When I had made the call, the nice young lady who answered told me I was denied. I was like oh, really? In her notes to resend to the underwriters she put in all the notes we talked about in the call. There’s a fine line that needs to be drawn. If you think about this: bull$hit and lying, they’re not very far from each other. That being said, I never lie. I don’t tell the CSR that my identity was stolen and that’s why you see all these hard inquiries on my credit report and I’m adding all these new cards and I’m actually applying for XYZ today. That’s lying. If you go back to all my arguments, they all have truth to it. If you lie, you may want to reconsider your lifestyle. The lack of integrity does not build trust. I am signing up for the US Bank Cash+ card because I want to use it only for online purchases, I don’t want my card to be skimmed. It’s a little bit of BS because depending on the card, I do take it outside and give it a little exercise instead of using it exclusively for online purchases. I actually lost count the number of times I have used this line because it’s so easy, powerful, and plays into everyone’s fear of getting their credit card number stolen. I did not use this excuse with Citi because I thought I had a solid alibi. Coincidentally over the weekend I called Citi to take care of some business and asked about a product change which they couldn’t do. A few days later, as luck would have it, the improved Thank You Premier bonus came up and I thought I’d try something new to convince the agents. You do know that a credit limit increase with them — and perhaps others — will incur another Hard Pull on your credit report, right? I know this to be the case as we had requested what it would take for an increase on the Flexperks AMEX and they advised that it would entail a hard pull. You will get a hard pull with most issuers for a simple credit line increase request. Decreasing your CL should not get a hard pull, but YMMV. Reconsideration calls and letters, especially if not done very quickly after denial may result in another hard pull as the blogger found out. At least they told him. I know that Barclay does another hard pull if you reply after 30 days since denial. That timeframe seems reasonable though. Just some data points. Was denied on a Citi Thank You card, because of too many inquiries. Had just done 3 apps, have 25 active cards. Didn’t want to call because the only cards I have with Citi are 3 Hiltons with little to no activity lately. I figured that would be brought up. I was successful once by writing Citi so I did that again and was just approved by e-mail yesterday. Just mentioning it since others may benefit.